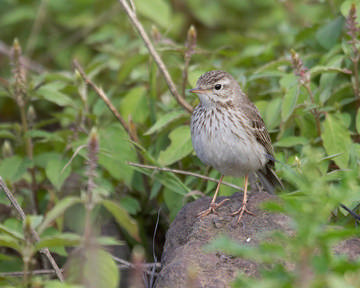 This is the commonest bird, and the most obvious, in the eastern hills, but is equally at home in low-lying areas near the coast and on rough land in some sites inland. They seem to favour some post-industrial land, including brownfield sites in peri-urban areas and the edges of sand quarries. Meadow Pipits avoid mature trees and are mainly birds of rough grassland or moorland, but the submitted habitat codes for all birds do not show that, with 102 farmland, 43 semi-natural grassland, 22 on estuarine saltmarsh and 11 heathland and bog. A truer picture is obtained for the tetrads with confirmed breeding only: 24 farmland (11 of which were unimproved grassland, with 9 improved grassland), 22 semi-natural grassland, 15 estuarine saltmarsh and 7 heathland and bog. The map exaggerates the species’ apparent presence during the breeding season. Many of the small dots are probably attributable to passage birds. Spring passage, of birds returning from as far as Iberia and Morocco, is noticeable through March and into April, and birds may be found in apparently suitable breeding habitat for a day or two, males sometimes singing, but they do not stay to breed. Further, half (17 out of 32) of the ‘probable’ breeding record codes are ‘D’ – display – and some observers have allotted this code to the characteristic ‘parachuting’ song flight of a single bird. Most birds in the lowlands are paired on territory during April, although they are later at higher altitudes. The 119 broods that I have ringed at Frodsham Marsh, 1981 to 2007, have hatching dates from 7 May, with the peak of first broods hatching on 18 May. Most females lay five eggs and raise an average of 4 chicks, and many pairs have a second brood in July, averaging 3 chicks. They betray the presence of chicks with their anxious ‘pit-pit’ calls, but the nests can be challenging to find, and only 9 tetrads recorded NY or NE, with a further 3 FS codes as adults sometimes carry their chicks’ faecal sacs one hundred metres or more before dropping them. Meadow Pipits eat, and feed their chicks on, a variety of flies that they find on the ground. They mostly take the flying forms rather than larvae, especially favouring the seasonally abundant craneflies and mayflies. Adults are obvious when carrying beak-loads of invertebrates for their chicks, and 44 of the 67 confirmed breeding codes were FY. Chicks leave their nests before they can fly properly, and 11 tetrads furnished RF records of chicks fluttering weakly. The BTO analysis of 2004-05 BBS data puts the breeding population of Cheshire and Wirral as 5,300 birds (with wide confidence limits of 190 to 10,410). As shown by the abundance map, most of these are in the eastern hills, with the moorland areas holding as many as 68 birds per tetrad. The best habitats can hold local concentrations up to perhaps 1 pair per hectare (Simms 1992), a density equivalent to 400 pairs per tetrad.